After acquiring a vintage record player recently I'm about to embark on the magical journey of building my own vinyl collection. A few weeks in and it doesn't look like it's going to be a cheap hobby, that's until I discovered the luckiest shop in Stokey. I don’t often rummage a Saturday afternoon away on Stoke Newington’s increasingly neat and tidy Church St but then this was my first ever day of crate digging! After 20 years of thrifting, I’ve finally lifted the lid on collecting vinyl and the discovery of Get Lucky yesterday was a joy and a pleasure and a real reason why I must get a basket for my Raleigh Caprice so I can carry more home. This fabuslously old fashioned second hand record store and book shop is like walking into a piece of living breathing pop culture. It’s literally bursting at the seams with every single piece of wall space covered with 7″ singles, rare and novelty LPs, comics ‘n paperbacks and shelving towering up to the ceiling and crate upon crate of music to discover. 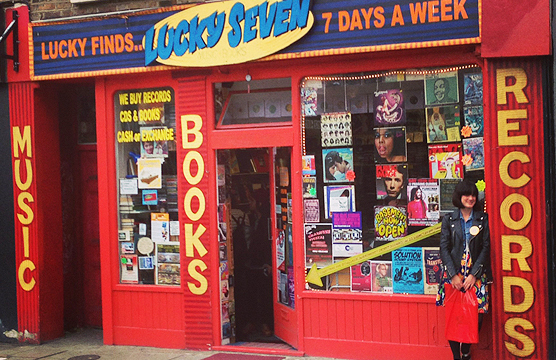 I can imagine Joey Ramone hanging out the back and searching for Bowie and Beatles records. Don’t blow your budget in the front room though, shimmy through to the back (with Joey) where you’ll find 3 records for £2 and dive downstairs for prices from 2p. The best thing about those prices is you can take a gamble on a record when you like the album artwork and I’ve a feeling this is going to account for the majority of my vinyl purchasing. The place was busy too with a real vibe, the guy at the till was DJ-ing to the shop audience and after our conversation about Lou Reed he played some Velvet Underground. Brilliant! This is how I want to shop and I can’t recommend it highly enough.